Looking for people to hand out info at the polls! We have all kinds of Candidate and proposal info to pass out at the polls. Please let either Ross Ensign or Mari-Ann Henry know if you are available to assist, or would like more info. This one is this evening! We are still door knocking & phone banking! Candidates also need our help at the Polling stations. Please call to see where you can help the most. Every Monday and Wednesday between now and election night, there are volunteers doing some phone banking at OCRP HQ, 42611 Woodward Ave in Bloomfield Hills. Just stop on in and grab a phone list! If you can't make it those nights, call to see what other nights they may be doing this. AND THEN DONT FORGET TO VOTE!!! Tuesday, Oct 23: Fundraising with Mike McCready at Lockhart's in Lake Orion! 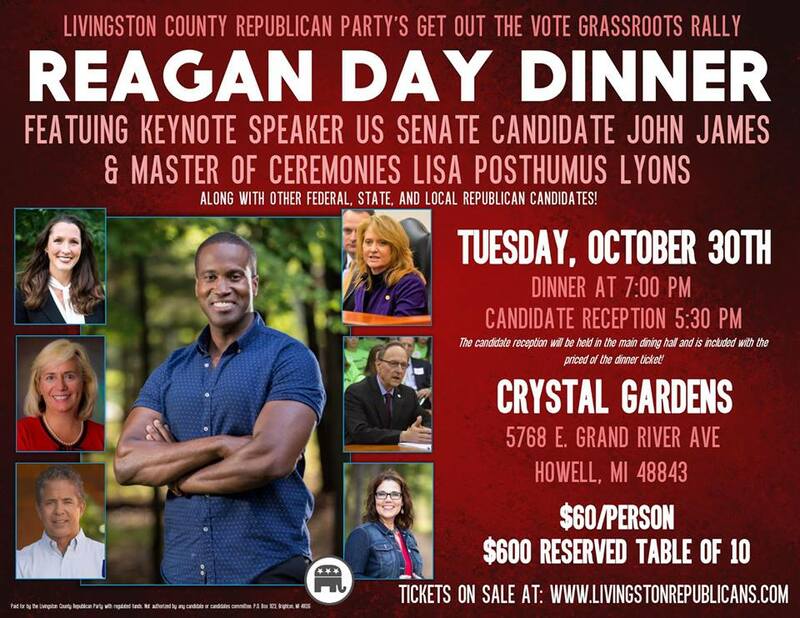 Tuesday, Oct 30: the Reagan Dinner with the Livingston County Republican Party. Join our 8th CDRC patriots with John James! With Lisa Posthuma Lyons as the Master of Ceremonies.At the Crystal Gardens banquet center in Howell. on (M-24) 741 S. Lapeer Road, Lake Orion hosted by Mike Gingell, Mike Spisz, Mike McCready, John Reilly, and of course, GOGOP! See you there!